Tumorigenesis relies on the ability of cancer cells to obtain necessary nutrients and fulfill increased energy demands associated with rapid proliferation. However, as a result of increased metabolite consumption and poor vascularization, most cancer cells must survive in a nutrient poor and high cellular stress microenvironment. 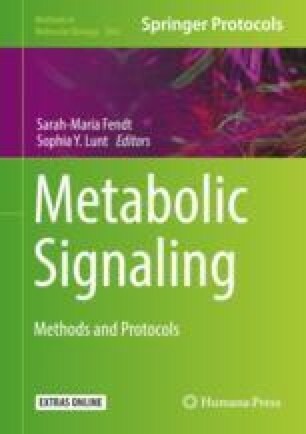 Cancer cells undergo metabolic reprogramming to evade cell death and ensure proliferation; in particular, cancer cells utilize the catabolic process of autophagy. Autophagy creates an intracellular pool of metabolites by sequestering cytosolic macromolecules in double-membrane vesicles targeted for lysosomal degradation. During times of environmental stress and nutrient starvation, autophagy is upregulated through the dynamic interactions between two nutrient sensing proteins, AMP activated protein kinase (AMPK) and mechanistic target of rapamycin (mTOR), in cooperation with Unc-51 like autophagy activating kinase 1 (ULK1). In this way, a lack of metabolic nutrients plays a critical role in inducing autophagy, while the products of autophagy also serve as readily available fuel for the cell. In this chapter, we describe methods to visualize and quantify autophagy using a fluorescent sensor of autophagic membranes. Thus, the impact of specific nutrients on autophagy can be measured using live-cell fluorescent microscopy. This work was supported by NIH grant number R01CA197398 from the National Cancer Institute. The funders had no role in study design, data collection and interpretation, or the decision to submit the work for publication.